Double Hand Spinners, Science Fair Ideas: Educational Innovations, Inc.
Do fidget spinners really teach anything? You bet they do! 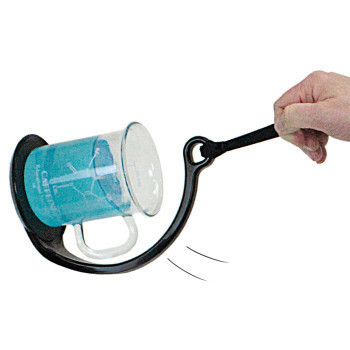 Our Double Hand Spinners offer more teachable physics - at such a reasonable price - than almost anything we've seen. Do fidget spinners really teach anything? You bet they do! 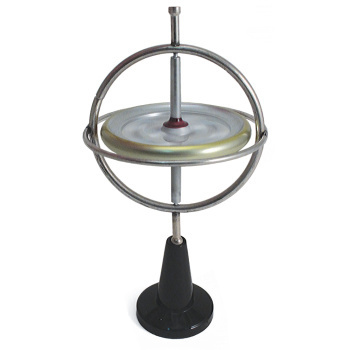 Our Double Hand Spinners offer more teachable physics - at such a reasonable price - than almost anything we've seen. Start by using a single spinner to discuss all three of Newton's Laws. Then attach the spinners together and observe how their contra-rotational motion can cancel out angular momentum. Go even further and add the six neodymium magnets (included) to the spinners' arms to open up an exciting new area of exploration involving magnetic forces - both attraction and repulsion. Your students will be riveted by this memorable, unique demonstration. Includes two spinners, a connector, six neodymium ring magnets, and lesson. Colors and styles may vary. Read more on our Blog - Fidget Spinners, Physics and Sir Isaac Newton! An amazing discrepant event that each student can experience directly. Spin them in the same direction: angular momentum vectors add- students will feel the gyroscopic stability as the device "fights" changes in orientation of spin axis. Spin them in opposite directions: angular momentum vectors cancel- even though each spinner has angular momentum, the opposite vectors cancel and there is zero resistance to changing orientation. This tactile demonstration gives students a sense of the reality of angular momentum vectors, and leaves a lasting impression. Students can use the Double-Hand Spinners to develop a simple sketch, drawing, or physical model to illustrate how the shape of an object helps it function as needed to solve a given problem. Students can use the Double-Hand Spinners to plan and conduct an investigation to compare the effects of different strengths or different directions of pushes and pulls on an object's motion. Students can use the Double-Hand Spinners to plan and conduct an investigation to analyze data to determine if a design solution works as intended to change the speed or direction of an object with a push or a pull. Students can use the Double-Hand Spinners to plan and conduct an investigation to provide evidence that vibrating materials can make sound and that sound can make materials vibrate. 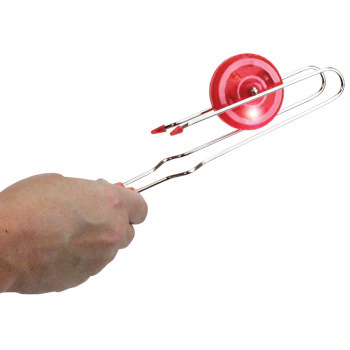 Students can use the Double-Hand Spinners to plan and conduct an investigation to determine the effects of placing objects made with different materials into the path of a beam of light. Using the Double-Hand Spinners students can plan and conduct an investigation to provide evidence of the effects of balanced and unbalanced forces on an object's motion. Using the Double-Hand Spinners students can make observations and/or take measurements of an object's motion to provide evidence that a pattern can be used to predict future motion. 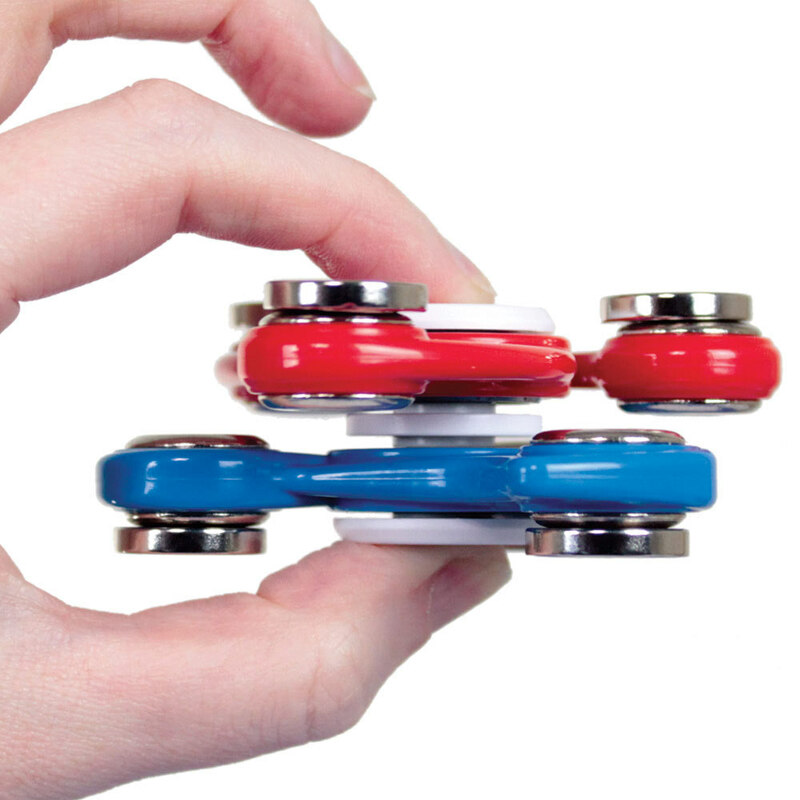 Using the Double-Hand Spinners students can add the Neodymium Ring Magnets to ask questions to determine cause and effect relationships of magnetic interactions between two objects not in contact with each other. Using the Double-Hand Spinners students can apply scientific ideas to design, test, and refine a device that converts energy from one form to another. Using the Double-Hand Spinners students can plan and carry out fair tests in which variables are controlled and failure points are considered to identify aspects of a model or prototype that can be improved. Students can use the Double-Hand Spinners to plan an investigation to provide evidence that the change in an object's motion depends on the sum of the forces on the object and it's mass. 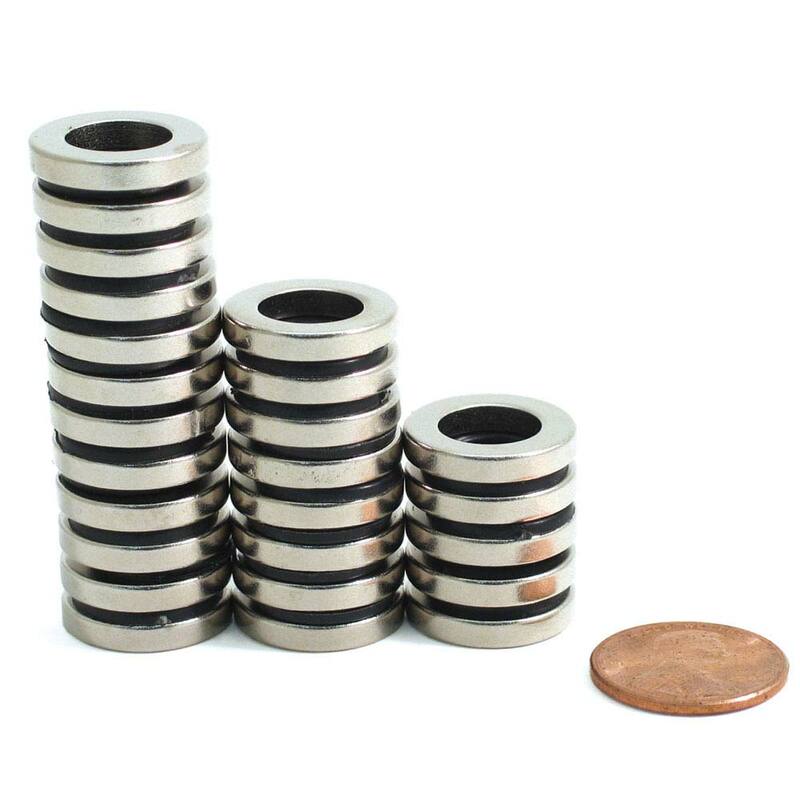 Students can use the Double-Hand Spinners and Neodymium Ring Magnets in an investigation to develop a model to describe that when the arrangement of objects interacting at a distance changes, different amounts of potential energy are stored in the system. 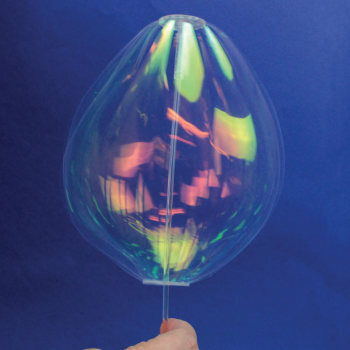 Students can use the Double-Hand Spinners and a bright beam of light to plan an investigation to describe that waves are reflected, absorbed, or transmitted through various materials. Using the Double-Hand Spinners, students can investigate and analyze data to support the claim that Newton's Second Law of Motion describes the mathematical relationship among the net force on a macroscopic object, its mass, and its acceleration. Using the Double-Hand Spinners, students can use mathematical representation to support the claim that the total momentum of a system of objects is conserved when there is no net force on the system. Using the Double-Hand Spinners, students can design, build, and refine a device that works with given constraints to convert one form of energy into another form of energy. Using the Double-Hand Spinners, students can develop and use a model of two objects interacting through magnetic fields to illustrate the forces between objects and change in energy of the objects due to the interaction. The Double Hand Spinners offers many teachable physics concepts at all levels. Students can start by using a single spinner to discuss all three of Newton's Laws. Then attach the two spinners together and observe how their contra-rotational motion can cancel out angular momentum. Students can add the six neodymium magnets that are included to the spinners' arms to open up an exciting new area of exploration involving magnetic forces - both attraction and repulsion. When students get the spinner going really fast, have them carefully hold it up to their ears. Aside from the sound of the bearings, they will hear the lower humming sound, which are actually micro changes in air pressure. That sound changes as the speed changes. The students can use the slow-motion video on their smart phones to capture detailed evidence of the fast moving spinners in their investigations or share information with other students.